Documentation: Specimen: HMM 1782, 26 Sep 1914 Inland, Clay Co (Swenk, Notes Before 1925). Taxonomy: No subspecies are recognized. This species was recently moved from genus Anas to genus Mareca, based on genetic studies (Chesser et al 2017). 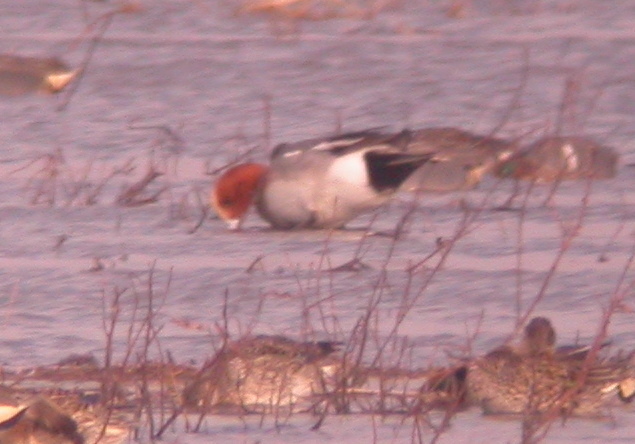 A hybrid Eurasian Wigeon X American Wigeon was at Funk WPA, Phelps Co 6-7 Apr 1994 (Silcock and Rosche 1994), another was at North Hultine Basin, Clay Co in 1998, and a third at Massie WPA, Clay Co 9 and 22 Apr 2000. Such hybrids were discussed by Palmer (1976). There are 34 spring reports, 21 in the period 10 Mar-10 Apr. Before and after these dates, documented reports are of a pair 21 Feb 2014 at Walnut Creek Lake, Sarpy Co (Brogie 2015), 29 Feb 1988 Seward Co (Mollhoff 1989), 5-7 Mar 2009 Funk WPA, Phelps Co, 25 Apr 1992 Dawes Co (Morris 1992), 27 Apr 1996 Clay Co, 2 May 1998 Clear Creek WMA, Keith and Garden Cos (Brogie 1999), and, latest on record, 15 May 2011 Sarpy Co (Brogie 2011, 2012). Fall: There are six reports, four documented: 26 Sep 1914 Clay Co (cited above), 11 Oct 2009 Morrill Co (Brogie 2009), 29 Nov 1966 Lincoln Co (Shickley 1968), and 20 Dec-8 Jan 1986-87 Scotts Bluff Co (Mollhoff 1989). In the Interior of North America, fall records are fewer than in spring, the reverse of the east and west coasts, where there are far more fall records (Edgell 1984). Edgell, M.C.R. 1984. Trans-hemispheric movements of Holarctic Anatidae: the Eurasian Wigeon (Anas penelope) in North America. Journal of Biogeography 11: 27-39. Palmer, R.S., ed. 1976. Handbook of North American birds. Vol. 2. Waterfowl (Parts 1 and 2). Yale University Press, New Haven, CT, and London. Swenk, M.H. Notes before 1925. Bird notes from A.M. Brooking of Hastings, C.A. Black of Kearney, and B.J. Olson of Kearney, based chiefly on their collections, up to January 1, 1925. Typed manuscript in NOU Archives.